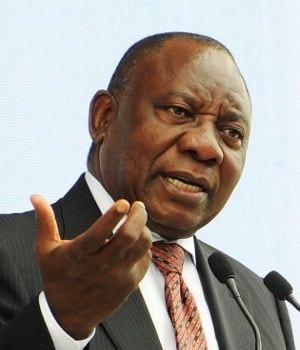 President Cyril Ramaphosa on Friday lamented the recent spike in mine deaths, while praising Mineral Resources Minister Gwede Mantashe for driving the public engagement process of the draft Mining Charter since he took over in February. Addressing the elective congress of the National Union of Mineworkers (NUM), Ramaphosa said government is committed to finalising the charter, which the industry has criticised as unconstitutional. “We want this charter to be finalised so that we can reposition the industry. I have said that we see the mining sector as a sunrise industry and that there is space for it to play a key role in the growth of the gross domestic product (GDP),” said Ramaphosa. Last week, Mantashe unveiled the revised charter following months of public consultations with the industry and communities. “The Mining Charter will be used to balance policy certainty, deal with the challenges of inequality and also promote transformation,” he said. The Mineral Council, which represents the mining industry, has raised concerns that the charter will not promote competitiveness, investment, growth and transformation. The council has described the charter as "unconstitutional and contrary to South African Company Law", saying it does not support a free-carried interest of 5% allocated to each of the labour unions and communities. However, the council supports the 30% black ownership target on new mining rights. The public has 30 days to comment on the charter. Ramaphosa told NUM delegates that mine workers must not just be awarded in wages and bonuses, but they must also enjoy greater participation in the sector. He applauded Mantashe for championing the charter, which is hailed as one of the key policies aimed at addressing the economic injustices of the past. Ramaphosa is the founding general secretary of the union formed in 1982 and Mantashe was appointed to the same position in 1998. He lamented the recent spate in mine deaths, saying it cannot be that thousands of workers are killed “for an ounce of gold”. Over 40 mine workers have been killed in underground accidents since the beginning of the year. The majority of the fatalities occurred at gold mines owned by mining group Sibanye-Stillwater.